The U.S. economy is on the mend, but the patient appears to still need substantial care. Jobs are being added at a snappy pace — 288,000 in June, with unemployment falling to 6.1% — but GDP growth remains weak, just 2.1%. 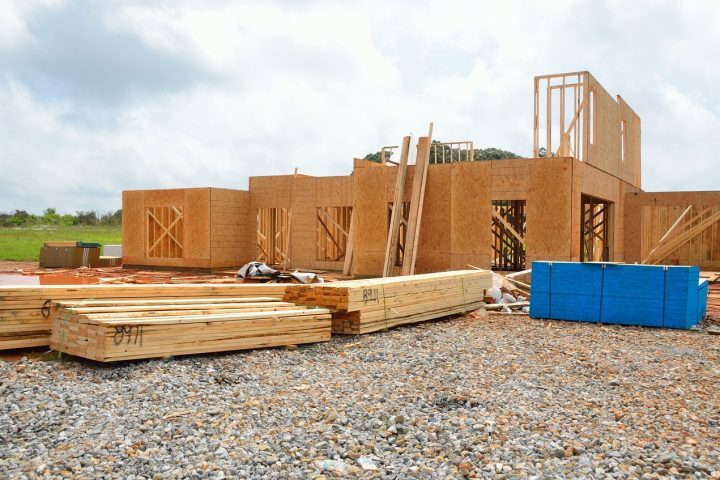 And after gains in the crucial housing market in 2012 and 2013, construction starts declined 9.3% in June 2014 — not a good sign given housing’s importance to the economy as a whole. These trends affect all communities large and small, and for reporters covering these issues, nuance — and data — matter. The latest report from Harvard’s Joint Center for Housing Studies, “The State of the Nation’s Housing, 2014,” explores the challenges facing the sector, which on average makes up nearly 5% of U.S. economic activity. The authors see a range of factors holding back housing demand and household formation, including tight credit, lingering unemployment, stagnating wages for those who do have jobs and rising student loan debt. All these in turn are suppressing economic growth. The national homeownership rate fell to 65.1%, the ninth consecutive year of decline after it peaked at 69% in 2004. However, the drop was the smallest since 2008, 0.3%, indicating that the overall rate may be stabilizing. The long-term decrease in homeownership was sharpest among younger adults: The rate for 25- to 34-year-olds fell nearly 8 percentage points from 2004 to 2013; for those 35- to 44 years old, the decrease was approximately 9 percentage points, and for middle-aged households, 4 percentage points. Minority homeownership rates fell disproportionately from 2004 to 2013, dropping 6 percentage points for black households and 4 percentage points for Hispanics and Asians. For whites, the decline was just 3 percentage points. While the share of “underwater” mortgages has fallen significantly, more stringent credit requirements, rising home prices and an increase in interest rates are discouraging potential buyers. The rate for 30-year fixed mortgages rose from 3.6% to 4.4% over 2013, and the average score for Fannie Mae-backed mortgages rose from 694 in 2007 to 751 in 2013. 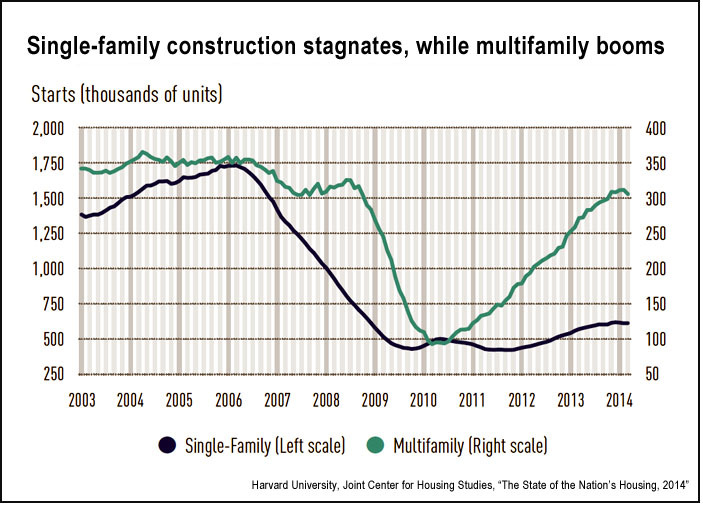 Single-family construction starts have recovered somewhat, while multi-family starts posted their third consecutive year of increases. Single-family housing starts are up — there were 925,000 in 2013, an increase of 18.5% over 2012 — but remain far below the long-term average of 1.46 million. Starts have stayed below 1 million for the past six years. Single-family permitting rose in 90 of the largest 100 metropolitan areas, but is still 48% below annual averages seen in the 2000s. Notable increases were in Atlanta (up 62%), Los Angeles (52%) and New York City (49%). Approximately a third of total residential construction, 310,000 units, was intended for the rental market, the highest rental share posted since 1974. Strong growth in multi-family construction was seen in cities such as Atlanta, Baltimore and Detroit, while the largest number of permits were issued in New York, Los Angeles and Houston. Mirroring the continuing decline in homeownership, the demand for rentals remains strong: In 2013, the overall vacancy rate fell to 8.3%, while rents rose 2.8%, exceeding the inflation rate of 1.5%. In the 20 most desirable cities, rents rose more steeply, averaging 6%, quadruple the inflation rate. Related research: Another 2014 report from the Joint Center for Housing Studies, “America’s Rental Housing: Evolving Markets and Needs,” examines the demographics of those who rent, the housing stock and its condition, construction trends and public-policy challenges now and in the future. Citation: Herbert, Chris; et al. “The State of the Nation’s Housing, 2014,” Harvard University, Joint Center for Housing Studies, 2014.